Pictured in Coláiste Chiaráin are Sargent Seamus O’Neill, Juvenile Liaison Officer and Garda Padraig Tobin, Juvenile Liaison Officer, Acting Principal Mr. Matt Power, Mr. John Kelly School Completion Programme. The representatives from the Gardaí were at the school to present Certificates of achievement and merit to the students who were nominated for the 2017 Garda Youth Awards competition, which was won out right by Diana Mirza, from Coláiste Chiaráin. All of the students were recognised for their individual talents and their contribution to their respective communities and to the school. Today’s presentation was a follow on from the Garda Youth Awards which took place in the Woodlands House hotel in Adare on 23/11/2017. Diana Mirza was the overall winner of this year’s competition which is a fantastic achievement as she was chosen out of hundreds of entries from schools and youth groups across Limerick. 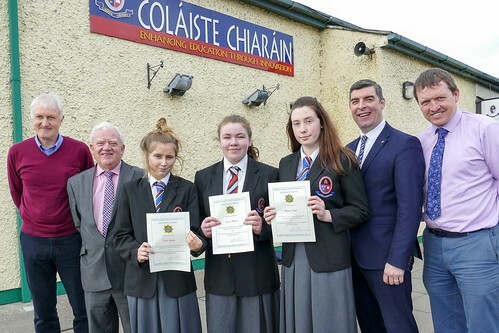 This marks the fourth consecutive year that Coláiste Chiaráin have been winners at the Garda Youth Awards. This is a testament to our fantastic students their families and the teachers and staff in Coláiste Chiaráin. Coláiste Chiaráin also provided the music at the 2017 event, Mr Moore and his wonderfully talented music students were greatly appreciated by the audience which attended the event. Well done to all the students on their fantastic achievements which were duly recognised today by these awards.